Read the full tutorial on how to make a very easy DIY Easter Wreath using paper in very less time. All you need is some colored patterned papers, cardboard sheets, glue and a ribbon. A handmade wreath idea easy enough for kids to try. For any festival the home decoration starts from your front door. And instead of buying something from them market, why not make something from materials available at home. This inculcates a love for handmade and creativity in kids. So try this inexpensive wreath idea which is easy enough for kids and decorate your front door. Step 1: Pick 10 different coloured patterned paper sheets. Step 2 : Cut plain cardboard sheet to create the base of the wreath as shown in the figure. Cut patterned sheets into egg shapes. For Easter I have chosen egg shape but if you want you can cut Heart shapes on Valentines day or star shapes. So the wreat could be made with paper cut outs of different shapes based on the occasion or what your kids likes. Step 3: Keep the shape of the cardboard sheet wider at the bottom portion. Now, let us keep all the shapes and cut outs ready to go ahead with the next steps of creating a Wreath using paper. Step 4: Start sticking egg-shaped paper cut outs on the base of the wreath created with cardboard. Stick these egg shape cut out such that they overlap a little on the immediate piece next to them. Create a loop with satin ribbon and stick it behind the wreath. This look can be used for hanging the wreath on the front door. You can also use it as kid’s room decoration. If you want you can add a bow at the top. Hope you enjoyed this easy craft idea to make Easter Wreath. Do let us know what you did using comments below. 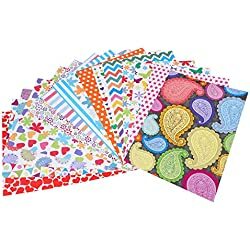 We have used below papers from Amazon to make this craft. In case if you liked this article on how to make an easy wreath at home do show your support by sharing this article. Don’t you find this DIY wreath idea fun? Try it, and let me know. Do share what you have made using comments below. Would love to hear from you.